Acanthus is a genus of about 30 species of flowering plants in the family Acanthaceae, native to tropical and warm temperate regions, with the highest species diversity in the Mediterranean Basin and Asia. This flowering plant is nectar producing and is susceptible to predation by butterflies, such as Anartia fatima, and other nectar feeding organisms. Common names include Acanthus and Bear's breeches. The generic name derives from the Greek term ἄκανθος (akanthos) for Acanthus mollis, a plant that was commonly imitated in Corinthian capitals. The genus comprises herbaceous perennial plants, rarely subshrubs, with spiny leaves and flower spikes bearing white or purplish flowers. Size varies from 0.4 to 2 m (1.3 to 6.6 ft) in height. Acanthus ebracteatus Vahl — This species occurs in South Asia, including Brunei Darussalam, China, South Taiwan, India, Malaysia, Philippines, Singapore, Thailand, Viet Nam, Cambodia, and Indonesia. In Australasia it is found in northeast Australia, northwest Australia, Papua New Guinea, and the Solomon Islands. Acanthus greuterianus Snogerup, B.Snogerup & Strid (2006) — This species was discovered in NW Greece. Acanthus montanus T.Anders. — West and Central African species, from Ghana in the west to Angola and the Democratic Republic of Congo. Acanthus pubescens Thomson ex Oliv. Acanthus polystachyus Delile — native to Burundi, Rwanda, DRC, Uganda, Sudan, Ethiopia, Kenya, Tanzania. Acanthus leaves were the aesthetic basis for capitals in the Corinthian order of architecture; see acanthus (ornament). Several species, especially A. balcanicus, A. spinosus and A. mollis, are grown as ornamental plants. Acanthus leaves also have many medicinal uses. Acanthus ilicifolius, whose chemical composition has been heavily researched, is widely used in ethnopharmaceutical applications, including in Indian and Chinese traditional medicine. 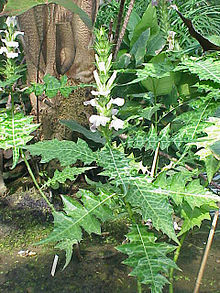 Various parts of Acanthus ilicifolius have been used to treat asthma, diabetes, leprosy, hepatitis, snake bites, and rheumatoid arthritis. The leaves of Acanthus ebracteatus, noted for their antioxidant properties, are used for making Thai herbal tea in Thailand and Indonesia. ^ "Acanthus". Germplasm Resources Information Network (GRIN). Agricultural Research Service (ARS), United States Department of Agriculture (USDA). ^ ἄκανθος. Liddell, Henry George; Scott, Robert; A Greek–English Lexicon at the Perseus Project. Harper, Douglas. "acanthus". Online Etymology Dictionary. ^ Quattrocchi, Umberto (2000). CRC World Dictionary of Plant Names: A-C. CRC Press. p. 23. ISBN 978-0-8493-2675-2. ^ Snogerup, S.; Snogerup, B.; Strid, A. (2006). "Acanthus greuterianus (Acanthaceae), a New Species from NW Greece". Willdenowia. 36 (1): 323–7. doi:10.3372/wi.36.36127. JSTOR 3997705. ^ "Acanthus greuterianus Snogerup, B.Snogerup & Strid — The Plant List". www.theplantlist.org. Retrieved 2017-12-13. 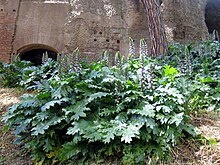 ^ "Acanthus syriacus Boiss". Germplasm Resources Information Network (GRIN). Agricultural Research Service (ARS), United States Department of Agriculture (USDA). ^ "African Plant Database". Les conservatoire et jardin botaniques de la Ville de Genève (Conservatories and Botanic Gardens of the City of Geneva). Retrieved 2 February 2019. ^ Wostmann, R; Leibezeit, G (2008). "Chemical composition of the mangrove holly Acanthus ilicifolius (Acanthaceae)—review and additional data" (PDF). Senckenbergiana Maritima. 38: 31–37. doi:10.1007/BF03043866. ^ Bandaranayake, W. M. (1998). "Traditional and medicinal uses of mangroves" (PDF). Mangroves and Salt Marshes. 2 (3): 133–148. doi:10.1023/A:1009988607044. ^ Chan, E. W.; Eng, S. Y.; Tan, Y. P.; Wong, Z. C.; Lye, P. Y.; Tan, L. N. (2012). "Antioxidant and Sensory Properties of Thai Herbal Teas with Emphasis on Thunbergia laurifolia Lindl". Chiang Mai Journal of Science. 39 (4): 599–609. "Acanthus L." Atlas of Living Australia. Chisholm, Hugh, ed. (1911). "Acanthus" . Encyclopædia Britannica (11th ed.). Cambridge University Press.